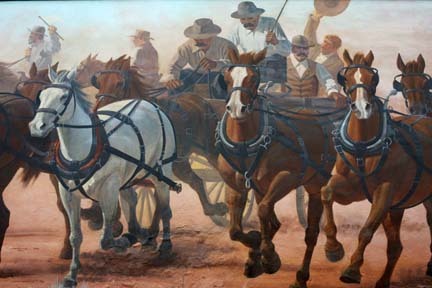 The Alva Mural Society was established in 1997 in Alva, Oklahoma, etc. The idea for a mural society originated with Fred and Betty Wenninger and Wayne and Beverly Kinzie after a trip to Toppenish, Washington. Toppenish has had a successful mural program for many years. After returning from their trip they organized the Alva Mural Society, which has been sponsoring one or two murals per year since. The Alva Mural Society tries to use only the best artists and highest quality materials in each mural so that they will last many years.